Here`s a picture of Shelley - if you look closely you can see where her stitches were. She had a large lump there before. It was something like a cyst - a big blob of fatty tissue. 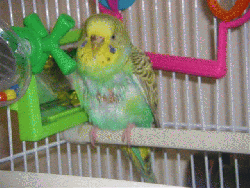 It isn`t as serious as a tumor, but budgies get them sometimes and people don`t take them to a vet to have them removed. The bigger they get, the harder it is to get ride of them. Sometimes they even get tangled up with important body parts, and then it can be fatal. But Shelley`s owner did take her in, and then realized that she couldn`t afford to pay for her surgery because she was out of work (the owner, not Shelley). So she called Mickaboo and we were able to help. Now Shelley is doing well and is ready for a new home. How about yours?